Can we can all agree that one of the best things about Austin is the nature around us? Even if your seasonal allergies are slowly killing you, as they are me, it’s wonderful to be surrounded by miles upon miles of parks and trails. What’s also great about Austin is that it offers adventure junkies several avenues for extreme sports like caving, mountain biking and rock climbing. Rock climbing is my personal favorite, but I’m not the most skilled. So I decided to do a little research on how an average Austinite, like myself, can get more involved in an extreme sport like rock climbing. To find the answer, I had to find the best rock climbing guide in Austin. 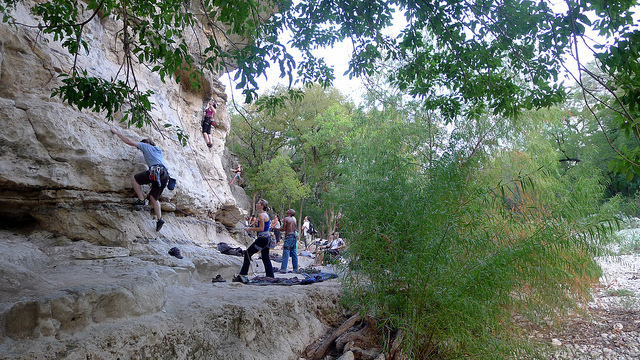 During my hunt to find the best climbing tours in Austin, I came across Rock About. Not only are they the longest running rock climbing outfit based in Central Texas, but they also have 156 5-star reviews on TripAdvisor. I don’t know about you, but I find that pretty impressive. The fact that 156 people all agreed on the quality and excellence of this company blew my mind. So I already had a good feeling about Rock About before I ever met one of their team members in person. That, and their name reminds me of an Australian walkabout, which is basically a long walking journey associated with Aboriginal culture. A long rock climbing journey with the best company in Austin sounds good to me. I wanted to learn more about Rock About and what they have to offer, so I met the owner Adam on a Wednesday afternoon in his office. And when I say office, I mean the rock climbing wall at Gus Fruh on the Greenbelt. Not only did I get an inside scoop on the ins and outs of climbing in Austin, I also got to climb a brand new route Adam had set just a few hours prior. Hear ye, hear ye! Let it be known that I was the second person to ever climb Aphrodite! All joking aside, I was able to get a sense of Adam’s climbing instructions in between my climb. He was an excellent instructor and helped me find the right footholds and handholds. He was very encouraging the few times I was “stuck.” I was also happy to hear that all of his guides/instructors are AMGA certified. One of the tricks, Adam explained, to getting more involved in a sport like rock climbing is to simply get out there. Rock About offers options from beginner and pro courses to guided adventures to help you do just that. 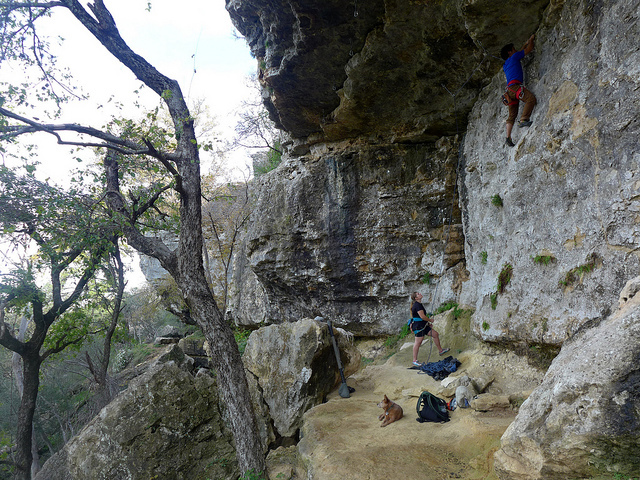 The limestone in Austin may prevent us from having basements, but it sure does give us beautiful walls to climb. 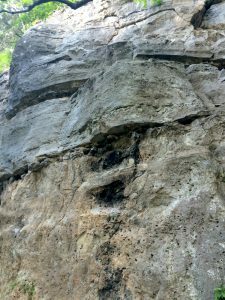 There are several great climbing spots on the Greenbelt as well as several locations just a day trip away which allow for a variety of climbing techniques to be learned. What I love about Rock About is they have classes that range from beginning basics all the way to trad climbing. I’m still a pretty novice climber, so I don’t feel comfortable lead climbing yet. But with Rock About, I can take their 300 level course and learn in good hands. If you have kids, Rock About is a great alternative to typical weekend activities. You literally have each other’s lives in your hands and there’s no better way to bond with your family than that. Building trust while being physically active is a great example to set for your children. Need a break from your kids? That’s why summer camp was created. 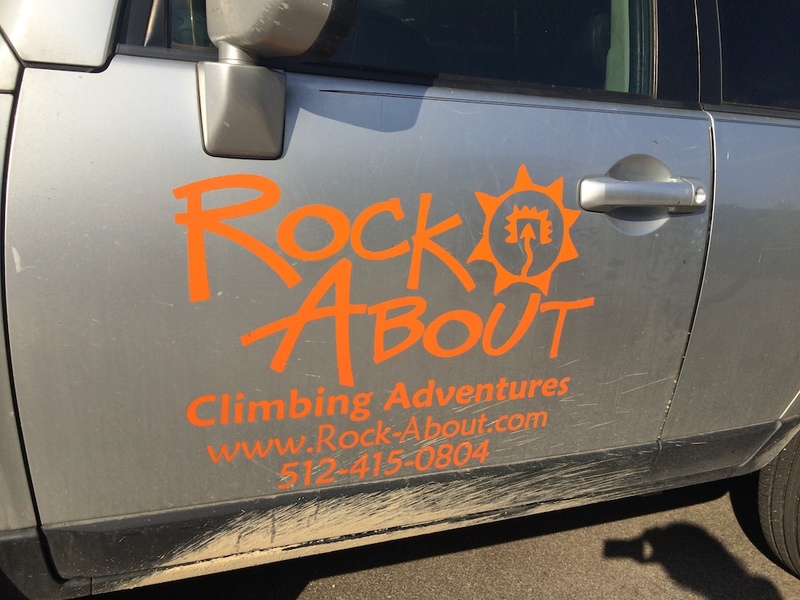 Rock About offers Summer Day Camps for kids age 10 and older where they’ll spend a week climbing all around Austin and the surrounding area. I know when I was a kid I was always climbing trees – we didn’t have huge limestone bluffs where I grew up. So why not encourage your young ones to try an alternative sport. 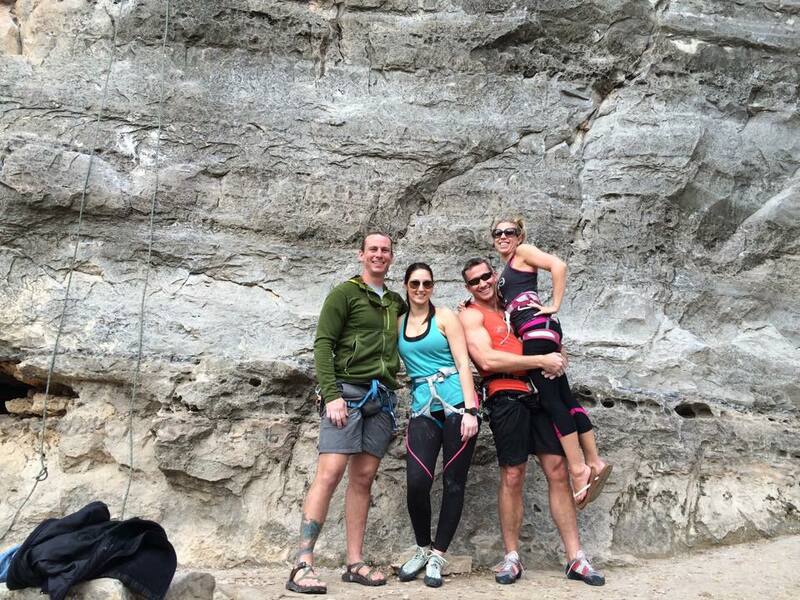 Whether you have visitors from Iowa or international guests from London, what better way to show off Austin’s natural beauty than rock climbing in the Greenbelt? Not all cities offer such beauty within city limits. So would you rather leisurely stroll through the Greenbelt, or conquer the Greenbelt? Give your guests something to write home about. The thing that impresses me most is Rock About offers a shuttle service to climb at El Potrero Chico in Mexico 4-5 times a year. These all inclusive long weekend trips include food, camping and travel expenses. I know where I’ll be going for my next international trip. When I started this journey, I wanted to know how an average Austinite like myself could get more involved in rock climbing. I learned that simply getting out there and learning from experts, like the folks at Rock About, is one of the best things to do. But it’s also about getting involved with the rock climbing community. They are a small and tight knit group. And, more importantly, they’re extremely friendly. They love what they do and want others to love the sport too. They’re always encouraging and willing to lend a hand, or a carabiner. Need more inspiration? Watch this YouTube video of an 11 year old climbing prodigy who is breaking climbing records left and right. It’s inspiring and makes me want to spend all my time on the wall. So get out there. Bring your family, friends and children and start learning from the best in Austin. 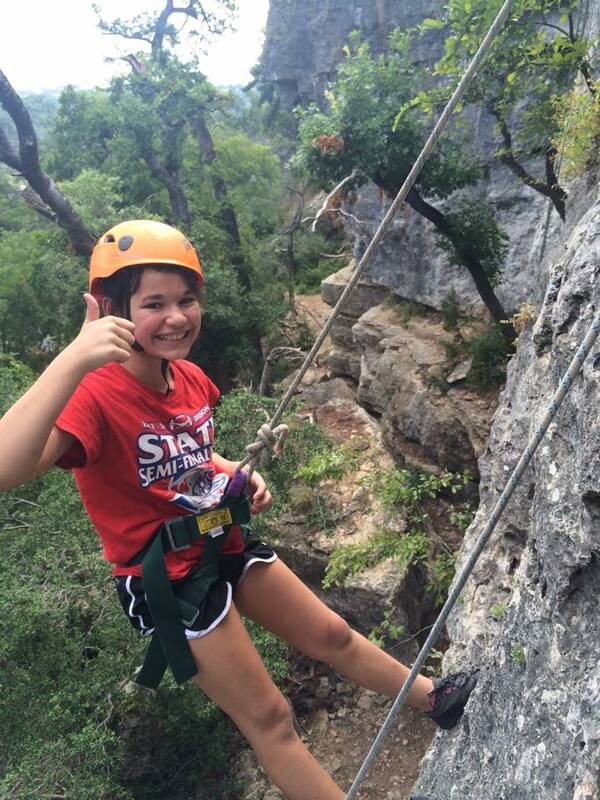 Where is your favorite place to climb in or around Austin?